Please join us for our 21st Annual Crime Stoppers "Party at Arrowhead" event. Table sponsorships and individual tickets ($100) are available for this "Taste of Kansas City" style event and includes food, drink, raffle, live and silent auction, the KC Chief's Cheerleaders and Mr. Len Dawson himself. Contact our office for additional information or questions. Donation items also accepted and we are a 501 c 3 organization. Thank you to all of our wonderful sponsors for this event. Eligible Kansas and Missouri high school seniors may apply. KANSAS CITY, MO --- The Greater Kansas City Crime Stoppers TIPS Hotline is proud to announce the introduction of new anonymous reporting software and mobile app to provide a more seamless and efficient way for students and community members to offer anonymous information to help solve and prevent crimes or other serious or life threatening matters. For over 34 years the Greater KC Crime Stoppers TIPS Hotline has received over 140,000 anonymous TIPS and paid out over $1,364,000.00 dollars in cash rewards for that information. Effective 1/1/2017 we will begin utilizing P3Tips.com and our existing website at www.kccrimestoppers.com to allow the entire Kansas City metropolitan region currently covered by Crime Stoppers to foster an enhanced relationship between law enforcement, media and the public to proactively create a safer community. TIPS previously accepted as SMS text messages using a short code and a dedicated keyword will be discontinued. The new software will allow submission of TIPS by phone, web, and by way of the new, FREE P3 Tips mobile app available on the iOS and Android platforms, greatly enhancing the mobile tip submission process. Still completely anonymous, tips submitted through the P3 mobile app, unlike SMS text tips, have no length limitations and allow images, video, audio and documents to be uploaded with the TIP. Anderson Software’s sophisticated encryption processes obscure any and all identifying information and provide assured anonymity for tipsters. Even without the app, there is still an easy and secure option for submitting TIPS from any PC or mobile browser by going to www.kccrimestoppers.com and clicking on the “give a tip” banner. Of course, TIPS are still welcomed through calling our hotline (816-474-8477). Using whichever method, once a person submits a TIP, they will be given a TIP ID and password. With this information they can login at www.P3TIPS.com and submit follow-up information, engage in real-time chat/two-way dialogue, be informed of the outcome of the TIP, and access any pertinent reward information. Anyone with information is urged to contact Crime Stoppers Greater Kansas City TIPS Hotline at 816-474-TIPS (8477), TIPS may also be submitted electronically at www.KCcrimestoppers.com under the “give a TIP” banner. Information leading to an arrest in the case could be eligible for up to $2,000.00 in reward money. ALL INFORMATION IS ANONYMOUS. Ferrellgas has unveiled its latest charity bobtail, designed to remind citizens of the crucial role they can play in the fight against crime. The company’s newest vehicle supports Kansas City Crime Stoppers and features a burnt orange, yellow and black color scheme and includes the yellow Crime Stoppers badge logo. A Kansas City non-profit community organization, Crime Stoppers enables citizens in the community to anonymously provide vital information that can assist law enforcement agencies. Local residents can call, text or provide tips via the Kansas City Crime Stoppers website. Since 2009, Ferrellgas has taken a number of its traditionally blue bobtail delivery vehicles and branded them with the logos and color schemes of local charities. Ferrellgas has two pink bobtails designed to raise awareness for the fight against breast cancer. There are red bobtails designed to raise funds for diabetes research and the fight against leukemia and lymphoma. Three camouflage vehicles help support various military causes. 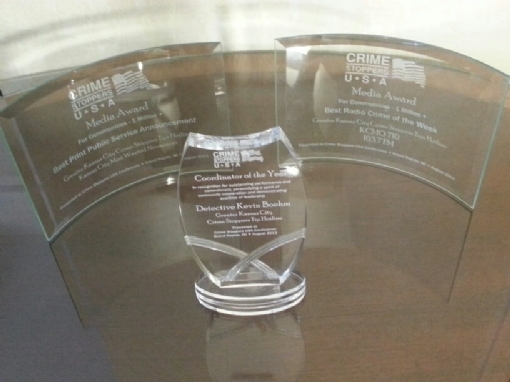 KANSAS CITY, MO --- At the recently concluded Crime Stoppers USA National Training Conference in Grand Rapids, Michigan the Greater Kansas City Crime Stoppers TIPS Hotline was recognized with three (3) national awards. Receiving media awards for communities of 1 million plus in population the program won for best print public service announcement for the Kansas City’s Most Wanted Newspaper. The paper is in its 115th issue, is printed every three (3) weeks and features over 100 felony fugitives. Since its inception the paper has been credited with 352 felony fugitive arrests thanks to information reported by anonymous tipsters who are then eligible for cash rewards. The program was also recognized for best radio crime of the week for a spot produced by 710AM and 103.7FM which featured board member Lt. Kelli Bailiff, Wyandotte County Sheriff’s Office. A short and long version of the spot was produced and aired on each station. Additionally, Det. Kevin Boehm, Kansas City, Missouri Police Department and Coordinator of the Crime Stoppers TIPS Hotline, was recognized as “Coordinator of the Year” by the organization. This marks the second time the Greater Kansas City program has received that award as the previous coordinator, Sgt. (Ret.) Craig Sarver, received the honor in 1999. The Crime Stoppers TIPS Hotline has been in Kansas City since 1982, receiving approximately 4,800 TIPS per year. Since its inception it has assisted in 10,396 felony arrests, clearing 23,960 crimes including 603 homicides, 1,609 robberies and 1,436 burglaries. Over $23,336,000.00 in property and narcotics has been recovered and $1,256,282.00 in cash rewards has been paid out. Anyone with information is urged to contact Crime Stoppers Greater Kansas City TIPS Hotline at 816-474-TIPS (8477), TIPS may also be submitted electronically at www.KCcrimestoppers.com, or by texting TIP452 and your information to 274637 (CRIMES). Information leading to an arrest in the case could be eligible for up to $1,000.00 in reward money. ALL INFORMATION IS ANONYMOUS. KANSAS CITY, MO --- The Greater Kansas City Crime Stoppers TIPS Hotline has reached a milestone arrest in its 30th anniversary year. The 600th homicide arrest in program history was achieved after the Kansas City, Missouri Police Department advised a suspect was arrested and charged with Murder II and Armed Criminal Action regarding a 2012 homicide. The Crime Stoppers TIPS Hotline thanks the tipster who provided the anonymous information and commends the work of detectives and prosecutors for clearing the case. We sincerely hope that the family finds closure to this unfortunate crime.